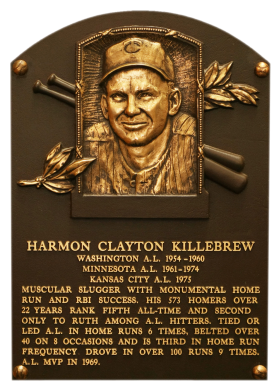 Harmon Killebrew hit 573 home runs, leading the league five times, each time hitting more than 40. "Killer" had 40 or more homers in eight different seasons. The 1969 AL MVP also drove in more than 100 RBI in nine years, pacing the AL three times. He hit only .256 lifetime but had 1,559 bases on balls. Comments: In February, 2000 I purchased a beautiful high-end rookie card of Harmon, a 1955 Topps PSA 8, from seller Dale Moody/Atlanta Sports Cards. I loved the card. 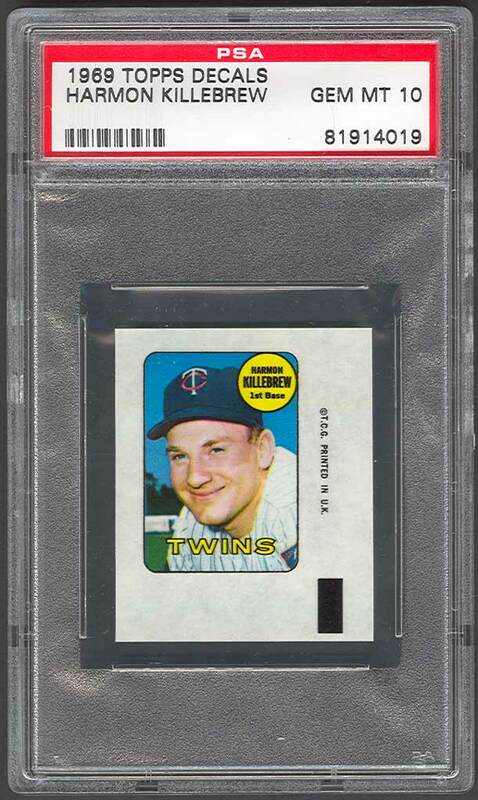 But in Feb, 2004 I decided to go with Newhouser to represent the 1955 Topps issue and needed to find a new type card for Killebrew. 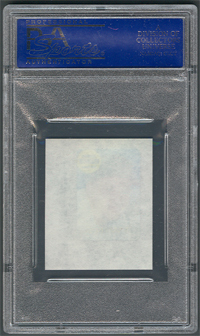 In November, 2007 I chose this 1969 Topps Decals issue and won this PSA 10 on eBay. Description: Designed as an insert for 1969 regular issue card packs, these decals are virtually identical in format to the '69 cards. The 48 decals in the set measure 1" X 2-1/2", although they are mounted on white paper backing, which measures 1-3/4" X 2-1/8". In March, 2001 a hoard consisting of two original 10,000-piece rolls - 833 each of half the players in the set - was sold at auction.